On Monday, we talked about the surprise math of a dream vacation. I say “surprising” because people put off these crazy, wild ideas for decades…even though you can break it down and actually get what you want surprisingly soon. For example, what seems like a crazy vacation to Paris — including an awesome hotel and eating wherever you want — can sound like an impossible $10,000 trip. Today, I want to talk about 3 counterintuitive things I learned about earning more. By the way, you won’t find many other people talking about this. It’s easier to talk about cutting back (which has its place), but fewer people, especially “experts,” can talk about earning more in a consistent, legitimate way. I’ve made this a really meaty article so you can dig in. Enjoy! When I was in college, I taught venture capitalists how to use Youtube and Myspace. And I got paid for it!! Notice that I didn’t think of myself as a fancy consultant. Also, who the hell ever thought they could use YouTube…and get paid for it? To every college kid, YouTube/Myspace were no big deal, but these venture capitalists had no idea what they were or how to use them. This is the funny part of earning more. Then we turn around and happily pay someone to change the oil in our car, clean our house, walk our dogs, repair a broken faucet, teach us how to dress better, build Powerpoint decks for us at work, teach us how to learn Spanish/accounting/teach our kids piano, and on and on. We spend thousands of dollars a year on services that other people provide, yet we turn to ourselves and think we have nothing to offer! Maybe you’ve housetrained 6 dogs in your life. Each of those ideas could generate over $50,000/year for you. These are all skills people will (and have) paid for. By listing out your skills, strengths, and interests, you can come up with many ideas for making money on the side. When we look at the math of how much you can earn on the side, what stands out? For many of us, at least at first, the idea of making $50/hr seems lofty, let alone $100 or even $500 per hour. When I first started consulting, I charged just $20/hr. And the truth is, a lot of people will pay you at that rate. But I quickly found that I didn’t want A LOT of clients. I wanted the RIGHT clients. I discovered 2 surprising facts about charging low prices. The lower my rate, the more people would try to haggle. This was amazing to me, but true. Hundreds of my students have had this same experience. Why is that? Logic would dictate that if you give clients a great rate, they’ll be less likely to balk at your price. But the truth is, when you price low, you attract customers that are looking for the lowest price, not the best value. Have you ever held a garage sale? Try to sell a lamp for a dollar. You’ll have people negotiating with you. That same lamp in a high-end antique shop priced at $100 and no one would bat an eye. People that want to pay less tend to be MORE work. When I charged $20 for my consulting, these clients would not only argue the price, but they were also the most demanding, difficult customers to work with. Later, when I charged $2,000 per hour, these clients didn’t argue with my price and they were actually LESS stressful. Clients that are paying a higher amount value your work and respect you more. They made a deliberate choice to invest in this service and they know your time and advice is worth it. Think about people that want to get fit. Why are personal trainers that charge $500/month or more so much more successful than gyms like Planet Fitness. Yes, part of it is the personalized, 1-on-1 commitment. But also, $10/month is just not enough to motivate you to use their service. You’re not invested enough that it actually motivates you to go. So, how do you get your clients invested enough to A) Pay higher prices and B) Be invested enough to value your services? By asking them to invest in you first. The best way to find out if a client is serious is to give them some “prework.” This could be an application process, a survey, or an intake form. This filters out the clients that aren’t ready to invest the time to work with you. If they don’t want to take the time now to fill out a simple survey, why would they take the time to follow your advice later? I’ve seen a lot of articles floating around that calculate “what’s your time worth?” as a way to determine your base rate. This is a completely backwards way to look at pricing. Nobody cares that you think you’re worth $50 or even $20 per hour. Nobody even really cares how long a project takes you. If you tell me that you can build me a website in 2 weeks, does it matter to me that you spend every day from sun up to sundown working on it? Or if you spend a grand total of 10 hours? No, I don’t care. You gave me the estimate, I’m ok with it, it doesn’t matter what happens in between if the RESULT is good. If I pay you $5,000 for a project that brings in $20,000 in revenue, your hourly rate is irrelevant to me. The only thing that’s relevant to me is the result. And what we see as the result is not always what the client sees as a result. Let’s go back to the website example. If I hire you to design a website for me, I don’t actually care about the website. I’m going say that again because it’s important. Your client doesn’t care about the website you make them. What they care about is the result the website can get. So as a web designer, the question you should be asking is WHY they want a website to begin with. Is it for new leads? Or for credibility? Or so that customers can find directions to my store on Google? These are all very different results and if you create a beautiful site, but customers still aren’t finding my store, I’m not happy. You gave me a result, but the wrong result. This works in any industry. Say we have a cake business on the side and we specialize in Disney cakes for kids’ birthday parties. What’s the result? Some moms truly want a cake that tastes delicious. But some want a cake they can take a picture of and post on instagram or Pinterest. See how knowing the result our customer is after can dramatically change our approach? Think of how easy it is to pitch a mom that’s desperate for that perfect Instagram photo of the party. Instead of wasting time giving samples and taste tests, you can show her what the cake and the display might look like. What would that woman pay for something like that? In both these scenarios, our “hourly rate” is trivial if we can deliver on the result. On a scale of 1-10, how satisfied were you with your last (vendor/consultant/etc.)? How could that have been changed that to a 10? What are your biggest sticking points right now? How have you been dealing with them? If we solved this problem, what would you do with that extra (time / resources / money / energy)? Of these ideas I’ve brought up, what do you like the most? What do you not like? What 3 specific things could we accomplish to meet this goal? Now it’s your turn. In the comments below, I want you to think of a time that you (or someone you know) paid someone for a service. Why did you pay for it? And what was the REAL result you were after? Leave a comment below with a surprising reason you paid for something. I pay, on a regular basis, someone to put eyelash extensions on me. It is a labor intensive ordeal of approximate 1 hour every 3 weeks in the salon… but- I do it to save myself the 2-3 mins every morning of applying mascara and 2-3 mins at night taking it off! But- the underlying reason is the eyelashes make me look alot better and younger and more awake- I need that in the job I’m in where I am around young people all day!!! this is a great interaction and really most important to me. I pay for someone looking after my marketing. Reason being I would like to devaote my time in New prospects than run behind clients convincing and manipulating them. Paying some incentives or consulting would have a great offline marketing beneficial for me as well as him for growth. thanks for this opportunity- to read insights that are thought provoking and on point- I am learning alot from you,! I regularly pay way too much for prepped and packaged food because I don’t want to feel like a line cook at home. Specifically, snack bars. It would not be that hard to just measure out a quarter cup of nuts and dried fruit and put it in a snack bag. Paying someone else to do it for me is just less energy. My husband and I pay a babysitter to watch our daughter while we work (her daycare doesn’t start until fall). This lets us, well, work! But the real reason we do it is so that we can both work at the same time rather than trading shifts, which means we have a precious couple of hours to spend together every night. I have paid for photography work of my vintage items. I could easily take my own pictures, and they will look good enough. But I would rather save the time and frustration by having my pictures professionally taken. I paid someone to help me put away my Christmas decorations. Not only did they get put away in a timely manner, I was confident that they were easy to access the next year. No use paying for something you aren’t going to use. You paid someone to help you brainstorm an idea? There’s hope I can make Paris by December! I am the king of ideas, really. I have not received the mail for it this year, but will opt in to pay $10 every two weeks to have someone mow my lawn. My reasoning for not paying last year was that 1) we have a perfectly fine lawnmower, 2) we save $10 every two weeks, and most importantly, the underlying 3) it’s stupid to pay someone else for something I could do myself in a mere 15 minutes! But no, truth is 1) I hate my life every time I have to get out the lawnmower, mow, then clean the clippings, 2) getting bug bites while doing it, and 3) I do a half-decent job that leaves sporadic grass and weeds sticking out. I will pay $40 for an hour of someone else’s time to do a better job, save me time and potential malaria, but most importantly, to not be miserable for 15 minutes every two weeks. I paid for a meal planning service for a year (when they held a huge discount). I actually love to meal plan, but I did this because I am trying to get my business up and running and needed to free up some of my time. I would totally pay someone to get rid of spiders too! My boyfriend knows that this is his job, but if he wasn’t there, I would pay without batting an eye! I have not paid someone or someone I know for a service yet. I was thinking of getting my clothes shortened because I am short (my clothes are too long). I wanted my clothes to look fitting and nice, not clumsy and look two sizes too big. Technically the result that I want is to be able to look as good as possible in the clothes I wear. Ramit, thanks for these three points. They are eye opening and got me into thinking about my own tutoring services. And I witnessed firsthand how price affects my business. When I charged $10.00 my students my students respect me more than when I charge less. But now I learned that I should be charging even higher. I was thinking about that actually. But I wondered how could I advertise or reach out to these kind of clients? And usually these clients will not he satisfied with just an increase in grades. They want A’s. I dont know if I can guarantee them an A. I may have met people who can help me reach out to these type of clients, but I was clueless whether I should improve my advertising design and method or if I should reach out to more people. Just a general train of thought. I really appreciate your insight about charging high vs. charging low. Now I know I’m on the right track, but I should be charging higher and looking for the right clients. Have an awesome day! A few years ago I paid someone to install hair extensions for me. I had done them myself with adequate results and for a lot cheaper than having someone else do it. However, I wasn’t looking for a nice style so much as the convenience of not having to do them myself. I build websites focused on getting results like Ramit mentioned in the article above. When I first started out a financial advisor whose website I built asked me to quote some additional work. He must not have liked my estimate because he wrote back and asked me “what it really cost.” I wrote back and politely suggested that we both worked in knowledge fields and I didn’t expect he got paid for the short amount of time he “really” met with his clients but rather on the value he provided them and that I got paid the same way. I never heard back. Good riddance. To the other extreme, I had a client happily pay $500 for what ultimately amounted to a few minutes worth of work when the database back-end of their website got corrupted and they “lost” several years worth of content and I was able to restore everything to normal. I pay to get my car washed. I can definitely do it myself, but I always put it off. I hate it when my car is dirty, and I feel like I can never quite get everything completely clean. Its just easier to pay for someone else to wash, vacuum, and detail it for me. The real reason is that I feel more confident driving around in a clean car and I love the compliments that I get when people see it. I once paid someone to negotiate a lower rate on my credit debt. I was afraid of haggling with the companies, afraid of failure, and afraid of facing the full magnitude of my debt. I told myself it was better to let someone more experienced do it but the truth was I was simply afraid, a fear stemming from ignorance. 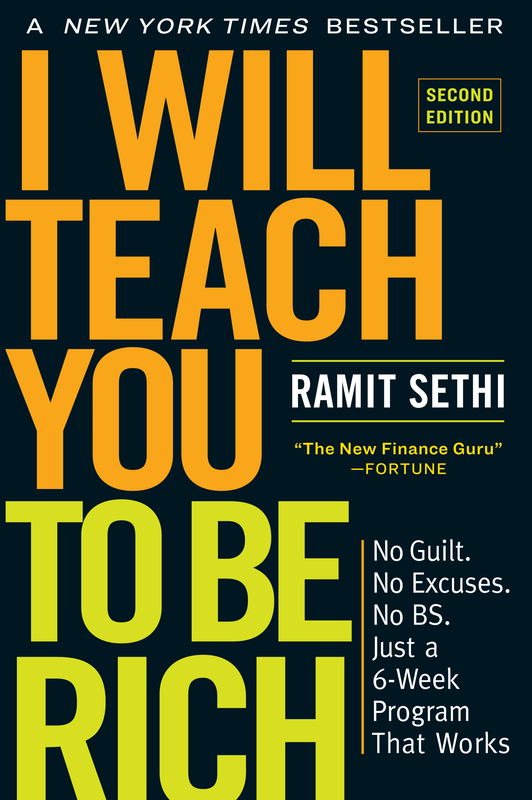 If only I would’ve read Ramit’s book sooner! The first thing that came to mind for me was about 10 years ago my mum got her attic converted into a large bedroom with an ensuite probably paying £10k – £15k and as she has spent so much money I told her I would paint the room but instead she paid a professional painter around £300 – £500 to do the painting of the attic. Every year since I first bought my house (at age 22, now 28), my nonnegotiable was paying someone to mow our lawn every week and handle any weeding that needed to be done each spring/fall. This amounts to about $1K a year give or take. We travel so much for work that it’s not worth my time, energy, or thought process to not only remember to do it (ok, or have my fiancé do it) but to also maintain a lawn mower, get gas for it etc. If we’re out of town for a few weeks, we don’t need to even think about the yard. Because we automated the process – after approving the estimate and paying upfront, they show up on time every week and do the job – it takes away ALL the stress and is more than worth the money we pay for it by simply getting back the time that would be taken up not only doing the actual chore but THINKING about the chore. My grad school friend recently paid a lady in a laundromat $50 to wash, dry, and fold all her clothes (about 5 loads). She travels a lot, and has a busy schedule, so she paid for someone else to do it. The REAL result was that she was able to spend time with her boyfriend and family and have clean laundry for work without multitasking and decreasing the value of either. I LOVE YOU, RAMIT! Great article! i found recently that my wife paid a company to fertilize our lawn. it has been a chore for us to take care of the lawn. I am also paid my kids to do our mow 🙂 although I have to supervise them the first time. I do not mind to do it on my own sometimes ..i see it like a work out but sometimes it becomes too much for me. I also recently go out to eat more often, because we have 3 kids it is so much less stress to eat outside ..no clean up, no mess ..it is just we have to pay more …but i think it is worth it! I pay someone else to repair my bike. This frees up time to focus on my side business, get ready for my night job (shower, eat, nap), and lift weights. I can do all these thing and still have my bike repaired and working for the next ride. However, this exercise made me think: I really want to know how to fix my own bike, so I do not HAVE to rely on someone else. Don’t think this was the intended outcome of this exercise, but I want to learn a new skill. By paying someone to do it now ,though, I free up my most valuable resource: TIME. 1) The real client is usually the parent. Never has a high school kid used their own money to pay for a tutor. We’ve had a few adult clients, but 90%+ of the clients are kids in high school or younger whose parents are paying us. 2) The parents aren’t necessarily paying for their child to learn Algebra or Geometry or whatever it is I’m teaching them. The parents almost always paying for something else. Usually that something else is college admission (as mentioned above) or bragging rights (parents love to brag about how their children are performing). But the most profound reason I’ve noticed that parents pay for a private tutor is so that their children will have the opportunity to live a better, richer life than they did.. I’ve heard stories of parents who screwed up in school and have lived to regret it. They have crappy jobs at which they earn $8 or $9 per hour and struggle mightily to make ends meet. To those parents, the chance for their child to become a professional and to have access to wealth and good employment is the #1 motivation for seeking a tutor. Some of those parents will be in tears begging my company to get their child motivated and back on track academically. Those parents don’t want their child to face the same humiliations. There are other reasons too that people find tutors, and I’m hoping that someone else will be able to shed light on some of those other reasons. I’m currently re-designing my tutoring company’s website and I want to write some killer copy for it. On two occasions my wife and I paid an accountant to do our tax return. We wanted to save time and get it done properly. The real reason is that we wanted to save tax by benefiting from the tricks of the trade. The first accountant was pretty cheap and we benefited from tax savings, we were very happy! The second accountant (a year later) cost us more and we didn’t really save any tax. We were much less happy! It’s a good illustration of your post. I love your statement: “Clients that are paying a higher amount value your work and respect you more. They made a deliberate choice to invest in this service and they know your time and advice is worth it.” This was eye opening for me! When my father wanted to retire to get his pension , he paid a lawyer 300€ to search the legislation and do the bureaucracy papers -that for my father more free time and less frustration in the waiting line ! Even though I know how to sew, I hate to put zippers in so I paid a friend to make a skirt for me. When I was in high school, my aunt paid someone to drive me to and from school. I’m not completely sure what her real intention was, but I suspect it was to make sure I wouldn’t be able to go anywhere after school without her knowing about it. I paid a lawyer over $300/hr to do my naturalization application. A lot of people told me I was nuts and I could do it myself, but I didn’t have the time, nor the willingness to fill out a lot of USCIS forms. The lawyer, did everything for me. From sending the check, receiving the application and just informing me when and where to show up for my interview. Surprisingly, a week before showing up to the interview, the lawyer “coached” me about what to say, and what is irrelevant. The date of my interview, the lawyer was there waiting for me. When travelling overseas I occasionally pay in advance for airport transfers. Yes, it costs more money than the train or a bus or even a taxi, yes it may not even end up saving me much time. But if I’m arriving somewhere that I don’t speak the language, it’s late at night and all I want is to get to my hotel directly, then I’m really not that bothered about the extra cost and I’m very keen on avoiding all the stress and hassle of having to figure out the other transport options and bus/train changes that I need to make, worry about local currency, and being taken on the “tourist route” in a taxi which doesn’t have seatbelts. I’d much rather pay a little bit extra and remove a lot of stress from my life. I live in Romania and most of us are very poor here. Or should I say … many of “them” are very poor here – because I consider myself an international citizen – at least in thought – and I plan not to continue being a “poor guy”. I struggled with health problems for many years. I admire all your work and I wanted to especially send you a “thank you” for this post – “3 counterintuitive secrets about earning more” … I recently paid a guy for helping me carry scrap metal to a Center. I also wanted to pay a neighbor for helping me bring home a Gas Central Heating Machine, with his motorcar. He refused. Hi Eusebio, I think it’s so great, that, even being “poor”, you still are able to think in a rich way, by paying someone for a service. I’ve paid to have “diet food” prepared for me and delivered to my house. I’m a good cook but its very difficult to prepare food everyday that is well balanced nutritionally and low calorie. This means I can lose weight, still be healthy and not have to plan, shop, cook and store everything. I pay for pedicures at a place that specializes in pedicures for men. Honestly it doesn’t matter that they specialize in it or not, I just do it because I don’t want to bother with trimming my toe nails myself. I’d rather spend my time doing something more focused on my passion/ career. It doesn’t hurt that they bring experience and expertise to the situation either. .. plus I leave with my feet hydrated, soft, looming and feeling great all while I was relaxing in the chair. I paid a consultancy to apply for a Master’s program in the US. To be honest, I could have done it myself. And I did do most of the stuff myself. But they were helpful when it came to the visa interview and stuff. They also helped me with proofreading my Statement of Purposes. They were there to remind me to meet my deadlines. I just wasn’t mature enough to do it myself at that time. I paid for a drill and a drill bit. I wanted a hole. I nearly split my side laughing when I read this!! Hysterical! I paid a freelancer to produce videos for me, post to youtube, my blog and prepare newsletters for me to send. I was looking truly to free my mind of off these tasks so I could see the big picture, be creative and have more free time to relax. I paid for a personal training program for my girlfriend. We could have train together at the gym, but the main purpose was: i wanted her to be exited about training with a personal training, seeing the result she want to see and at last ( the most important) stop negging in my head, that she isn’t happy about her body!!!! i paid for the delivery of my son. That sounds normal but i am living here in the philipines and one of the few things that is free in clinics and hospitals is giving birth. but it was such a happy occasion that i paid them anyway. best money ever spend! I’ve paid for someone to design a cover for seven novels even though I only have one completed. I wanted the others for inspiration and motivation. Thanks for your continuous current of great advice. I’m currently tutoring at a relatively cheap rate of $55-$65 per hour and I’d feel very badly if I shot up my rates on my current clients because teaching should be more about helping kids than gaining a profit. However, I will raise my rates on my current clients a paltry $5 per hour and remember not to undervalue myself for future clients. Thanks! Interesting insight! Just last week I paid a vet service to come to my house to see one of my cats. The reason was that he was having an allergic reaction to something and I was worried, but the real reason I used them is that I didn’t want the hassle and stress of trying to get the cat into a carrier to take him to the vet. It’s interesting what you’re willing to pay for that you don’t really look into too deeply. That was smart thinking. Animals stress over those sort of situations. In turn, so do the owners. This is a good one. I asked my mother to pay for music lessons because everyone in band wanted to challenge me for my seat. Needless to say, we were fortunate enough that the band leader knew members of the Symphony and I was able to take lessons for the clarinet member who was and maintained 1st Chair. I won many, many battles to keep my 2nd chair status throughout high school. I pay my bookkeeper to keep the books so that at the end of the financial year, she can push a button and the accountant has everything he needs to do our end of year tax return with no fuss. For her own reasons she leaves me an invoice with hours and an hourly rate on it but for me it is the job not the time. I noticed the watermark and I noticed that it was gone, and I wondered. Thanks for the note about it. I pay to have my shoes shined three times a week. I like really nice shoes. But the real reason I do so, I want to get details about future prospects schedule and some other relevant info. When I thought about this I realized there are a few things I have done that although I can do myself I rather have someone else do: wash my car (though I can do a more thorough job, I don’t always feel like doing it), doing my taxes (I hate doing it period), and having my hair cut and colored (cutting no, the coloring part takes practice and is a messy job to do at home). So I see, there are things that mere mortals (and not just rich people) can afford to pay others to do. Got me thinking! I bought this plant supplement that has a lot of medicinal plants in it. I knew that if I took it, it would be very healing for my body. So I bought it so I could be healthy, but ultimately, I want to be healthy so that I can be more happy and vibrant in my life. Bam. I didn’t know that before I’d read this article. We paid $1200 for an attorney to process my husband’s green card application after we got married. We could have used a paralegal for $300 or done it ourselves for $0. The reason is that we wanted the application and interview process done correctly and to go as smoothly as possible. The REAL reason is that I wanted access to an attorney’s E&O limits in the event something went really wrong with the process. At the time, an acquaintance filing for her green card used a paralegal and kept telling me I was wasting my money. My husband’s card was issued within 5 months of our marriage. Her paralegal lost some of the paperwork, failed to submit the forms correctly, and then disappeared when she asked for more help or a refund. In all, I believe it took her nearly 3 years to get it all straightened out. And, I have never once been sorry for paying the extra money up front. I paid an unemployed local artist to revamp a framed Vogue cover I had and had loved but always meant to redo it so I would love it more. As I’d almost ruined it and had no real vision for how to stretch it across my wall like I wanted, I met with the artist and we talked it out until she had a vision for it. That one cover became three interesting, original, and lovely works of art that decorate my wall much as I’d wanted and better than I’d envisioned. I always pay to have my clothes mended. Sewing really frustrates me, so I would rather just pay a professional to do it. I pay people on Fiverr to do things for me constantly. Usually graphic design-related projects that I have neither the skills to do myself nor the time or patience to learn how. But the real, underlying reason I pay for these services is to enhance the perceived value of products and services I offer, so I can charge more for them. I am feeling really motivated after reading all the comments. I am currently disabled and waiting for ssdi. I can’t do the things I used to but, now I have some new ideas and renewed motivation to use the strengths and skills I have not only for earnings but to make a difference. I really appreciate this site. Thank you!